Business users are already in love with Lenovo’s ThinkPad lineup thanks to the laptop’s understated design, excellent keyboard and focus on productivity. Lenovo thoughtfully added to its ThinkPad X1 range last year with detachable and convertible models, giving business users the same flexible computing form factors that consumers have long enjoyed. This year’s ThinkPad X1 Yoga, a convertible with a 360-degree rotating hinge, is an iterative upgrade for the form factor that debuted a year ago, bringing notable updates, like the use of Intel’s latest 7th Generation Kaby Lake processor, along with a sleek new silver hue. Priced starting at $1,682 from Lenovo’s web store, this year’s ThinkPad X1 Yoga competes directly against other enterprise convertibles like HP”s EliteBook x360 along with premium consumer offerings, like Lenovo’s Yoga 910, HP’s Spectre x360 and Dell’s XPS 13 2-in-1. Unlike the Dell model, however, Lenovo’s and HP’s convertibles come with a more powerful Intel Core i U-series processor instead of the more power conservative Core M Y-series chipset on the XPS 2-in-1 and Lenovo’s ThinkPad X1 Tablet, a device that offers a detachable keyboard similar to Microsoft’s Surface Pro. Even though Lenovo is pushing the ThinkPad X1 Yoga at business customers, consumers will also find a lot to love about this tablet. It offers plenty of ports, flexibility for expansion, an excellent keyboard, strong battery performance and a thoughtful design that makes it more equally adept in laptop and tablet form factors than other convertibles with a 360-degree hinge. We’ll dive deeper into these elements in this review. Like ThinkPads that come before it, the 2017 ThinkPad X1 Yoga is encased in a carbon fiber hybrid shell, making it durable and light—the convertible comes in at just under three pounds. What’s new is that Lenovo is breaking away from the traditional black hue that ThinkPads have become known for, and a second silver color option can be obtained on this year’s model. Our silver review unit has a coat that’s slightly darker than the brushed aluminum on Apple’s silver MacBook Pro or HP’s EliteBook x360, but the color is attractive and feels less intimidating and dominating than the traditional ThinkPad black. The silver makes the ThinkPad X1 Yoga feels more airy and welcoming, and the color choice also helps to hide fingerprints and grease well. ThinkPad purists, however, will likely want to settle for the all-black edition. Compared to the aluminum unibody construction of the competing HP EliteBook x360, the carbon fiber material feels less premium, but the upside is that it’s also more resilient to dings and scratches over time. Despite the Yoga in its name, Lenovo doesn’t use the intricately crafted watchband hinge that’s been a hallmark of its consumer convertible. Instead, you’ll get two strong 360-degree metal hinges on the rear, a design element that’s not unlike what’s found on the EliteBook x360 or Dell’s XPS 13 2-in-1. The hinge comes in a gunmetal finish and complements the dark silver nicely. The 360-degree hinge allows users to use in a variety of modes when converting between a laptop and a tablet. You can also stand the display up as a tent or fold the keyboard back in presentation mode. In use, the hinge feels sturdy, and although the screen exhibited some wobbling during a bumpy train commute, I never felt like the screen would move or drop its position. Our review unit comes with a 14-inch full HD LCD IPS display, but users can also upgrade to a 2K resolution screen with an OLED panel. The upgrade will give you even richer, more vibrant colors and inky dark blacks, which would be perfect for media consumption. The 14-inch panel is also larger than the 13-inch options that many of Lenovo’s rivals ship with. While I typically find 16:9 aspect ratio displays on most laptops limiting after having grown accustomed to a 3:2 aspect ratio on Microsoft’s Surface Pro 4 and Surface Book, I didn’t feel particularly cramped working on the ThinkPad X1 Yoga thanks to the extra inch of screen real estate. As a business system, the ThinkPad X1 Yoga is very slim, and if you find yourself working in a cafe on an off day, the silver color disguises it nicely against a sea of consumer laptops. At just 0.69 inches thick, the laptop has a relatively compact profile, measuring just 13.11 × 9.02 inches, thanks to slimmed down bezels on the top and sides. The bezels are no where as slim as on the standard Dell XPS 13 or HP Spectre x360, however, but they’re nowhere near as large as Razer’s 12.5-inch Blade Stealth. In spite of its slim size, the ThinkPad X1 Yoga feels more like a mini mobile workstation given the amount of ports that are packed onto the sides. On the left, you’ll find two Thunderbolt 3 over USB Type-C ports along with two USB Type-A ports. On the right, there’s an HDMI port, USB Type-A port, Mini-RJ45 port (though an adapter wasn’t included in our review box), combo audio jack, Kensington lock port and the power button. A silo for the Wacom-powered ThinkPad Active Pen is also found on this side, and the pen automatically recharges when it’s inserted in its slot. At just 0.1 inches taller than the 13-inch MacBook Pro with Touch Bar, Lenovo was able to outfit the ThinkPad X1 Yoga with plenty of legacy ports, allowing road warriors to use existing accessories and peripherals without having to buy costly dongles that could easily be misplaced or lost in transit. The microSD and microSIM card slots are found behind a covered flap on the rear, along with a vent for airflow. Photographers adopting the Lenovo ThinkPad X1 Yoga will likely want to bring along an adapter. There is a vent on the back where the hinge is for airflow, and two downward-firing speakers are located on the bottom. The bottom cover are secured by captive screws and locked into place with tabs. If you’re confident enough, you can remove the plate to make some upgrades. The RAM, unfortunately, is not serviceable, but you can replace the battery if it gets weak after a few years of use or swap out the M.2 format SSD for a larger capacity drive when your needs change. Additionally, if you choose not to purchase a model with a factory installed WWAN radio, you can remove the bottom cover, purchase a compatible Snapdragon X7 modem and install it yourself if you want to work off of your carrier’s LTE network rather than a Wi-Fi hotspot. The part is priced anywhere between $150 and $250, depending on the reseller, but if configured at the time of purchase, the modem adds just $140 to the price of your build. Lenovo has historically been known for its excellent keyboard, and fortunately the X1 Yoga doesn’t stray from Lenovo’s award-winning formula despite its more novel form factor. This year’s ThinkPad X1 Yoga comes with a very deep 1.8mm of key travel, making the keyboard an absolute joy to type on. If you’re working for extended durations in laptop mode, this keyboard is very responsive, and unlike the recent MacBook Pro keyboard, is dampened so it’s quiet when you’re tapping away in a meeting or conference room. Even after a day of continuous non-stop typing, I experienced no fatigue with Lenovo’s best-in-class keyboard on the ThinkPad X1 Yoga. For comparison, most Ultrabooks strive for 1.5mm of key travel, which offers a comfortable typing experience, but few laptops actually achieve this. The 2017 HP Spectre x360 13-inch, for instance, emulates the feel of 1.5mm of key travel by using more actuation force on its keys, which comes with 1.3mm of travel. The keys on Apple’s MacBook Pro barely even move, while Razer took a middling approach with its slim Razer Blade Stealth by offering a keyboard with 0.87mm travel. In the convertible Ultrabook space, the Lenovo X1 Yoga keyboard wins hands down. 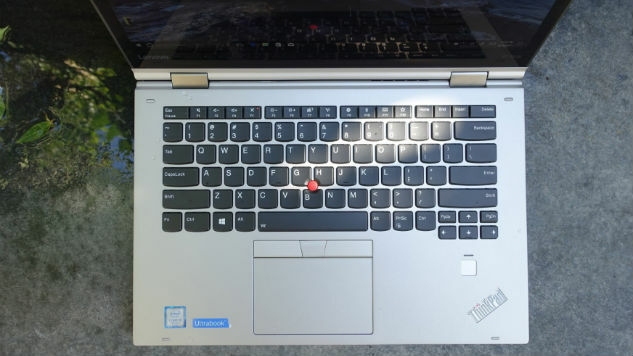 Another notable detail about the keyboard on the X1 Yoga is that even though the arrow keys aren’t full size, Lenovo gave them enough spacing to greatly improve usability. Consumers moving to a ThinkPad will need some time to adjust to the placement of the function and control buttons on the lower left side of the keyboard—on the ThinkPad, the function button is placed on the left edge, while most consumer keyboard start with the Ctrl button on the bottom row. The keyboard is also spill resistant, and Lenovo claims that the ThinkPad X1 passes 12 MIL-STD 810G tests for durability. The keyboard comes with a red trackpoint along with three track buttons. There is also a trackpad below the track button, which feels good and has a smooth surface for comfortable navigation. This year, Lenovo switches to Microsoft’s Precision Touchpad technology for more accurate tracking. By using Microsoft tech for the touchpad, driver updates and new features could be deployed more quickly through Windows Updates, rather than relying on third-party drivers, Lenovo said. The ThinkPad X1 doesn’t come with an IR camera for Windows Hello, but a fingerprint scanner comes standard on the keyboard deck and works very well. An excellent keyboard alone doesn’t set the X1 Yoga apart too much from its convertible competition. What makes the X1 Yoga a standout convertible is that it’s purposefully designed to be adept as a workhorse laptop and as a sturdy tablet. When you’re using other 360-degree convertibles as a tablet, the experience may not feel as solid because your fingers may be pushing into the keys on the keyboard while you’re gripping the device. To combat this issue and make the X1 Yoga feel more like a solid tablet, Lenovo made tweaks to the keyboard. On the first generation X1 Yoga, a complex mechanism would lift the keyboard deck and lock the keys, giving your fingers the illusion that you’re gripping onto a solid surface. This year, the mechanism has been redesigned and rather than the lift and lock deck, Lenovo is calling this its innovation the Wave keyboard. When the screen is folded over and the X1 Yoga is in tablet mode, the keys are pulled back flush into the keyboard deck. When this happens, it looks like a wave, and it gives a similar illusion of a one piece design when held. With fewer moving parts, the design works as advertised and makes the device feel more durable. With an excellent keyboard, the X1 makes for an excellent Ultrabook experience for those who prefer the laptop form factor. However, the X1 Yoga also comes with little, if any, compromises, when it comes to the non-removable keyboard for those who prefer working in tablet mode. The Wave keyboard gives you a solid experience when holding the tablet, and it’s a nice touch that’s currently without rival in the convertible space. Another nice addition for tablet user is the inclusion of a built-in stylus silo. By using a slim active pen, Lenovo was able to eliminate the digitizing layer on the screen, and the silo makes it convenient to access the pen on the go. Having convenient access to the pen makes it even easier to use the X1 Yoga as a tablet, whereas pen integration seems to be an afterthought on competing devices. The pen’s slim size means that it’s not quite as ergonomic for use during longer periods, but you can also purchase a pen with larger barrel from Lenovo for extended use. In addition to the FHD resolution screen on our review unit, Lenovo also offers a 2K LCD IPS screen option that adds $125 to the configuration cost along with an OLED touchscreen option. I haven’t tested the 2K OLED panel, but that may be the way to go if you need a brighter display with more contrast. The OLED panel adds $250 to the build total. Unfortunately, though, going with an OLED panel isn’t without compromises. If you choose the OLED panel, you cannot add a WWAN modem for LTE connectivity, which may be a dealbreaker for road warriors who may need a bright display with high contrast for use outdoors or in sunlight and mobile broadband connectivity. Our review unit ships with an Intel 2.60GHz dual-core 7th Generation (Kaby Lake) Core i5-7300U processor with 3MB cache (3.90Ghz Turbo Boost) along with 8GB LPDDR3 RAM and a 256GB SSD. Our model comes with the base 1080p display and an upgraded license to Windows 10 Pro ($30 extra). All configurations come with integrated Intel HD 620 graphics. The Ethernet adapter is a $35 accessory add-on that we did not get. As configured, our review unit is priced at $1,772.10 after discounts. The top of the line build comes with an Intel dual-core Core i7-7600U CPU, Windows 10 Pro, 16GB LPDDR3 RAM, 1TB SSD and a 14-inch WQHD OLED touchscreen display. That option is priced at $2,267.10 after discounts. Configuring the X1 Yoga on Lenovo’s website can be confusing, as some builds only come with certain features. For example, some Core i5 and Core i7 options can only be configured with 8GB RAM, while others offer a 16GB optional upgrade. All models come with a one-year depot warranty, and Lenovo also offers warranty upgrade options that covers on-site repairs, extended timelines up to five years from the date of purchase and accidental damage protection. The top five-year on-site program with next business day service, accidental damage protection and premier support adds another $739 to the purchase price. During my testing with Lenovo’s Windows 10 Signature Edition build, which delivers a very clean image of the operating system, I found performance to snappy and what you’d expect from a notebook with Kaby Lake on board. The OS does come with a few preloaded Lenovo applications, but it’s free of bloatware. I encountered no lags with the Intel Core i5 processor, and multitasking was a breeze. Running Microsoft Office—a one-year subscription to Office 365 was included on our review model—along with multiple browser windows with Microsoft Edge and Google Chrome, each with multiple tabs opened, was no match for the X1 Yoga. I was also able to do some heavy editing in Photoshop without any issues along with some light 4K video editing on Adobe Premiere. Video editors and gamers will likely want to choose a notebook with a discrete graphics card for even better performance, but if you’re on the go and need to edit a short film, you’ll do fine with the X1 Yoga thanks to improved graphics performance on Intel’s latest Kaby Lake generation processors. Unfortunately, the X1 Yoga was not able to complete the newer PCMark 10 test, likely due to compatibility issue with that benchmarking software at this time. Running Futuremark’s PCMark 8 Conventional Work benchmark, our configuration of the X1 Yoga achieved a score of 2,719 points and a battery life score of 5:53 minutes. During my use, I consistently got more than nine hours of battery life, making the X1 Yoga an ideal work companion for road warriors. Your battery life will likely vary depending on usage. Additionally, I found the screen brightness of the X1 Yoga to be on the dimmer side at 50 percent brightness. Under bright office lights, near windows or outdoors under shaded conditions, I find myself cranking up the brightness to 70 to 100 percent, resulting in a compromise on battery life. Given the X1 Yoga’s strong performance as both a laptop and a tablet, I wish Lenovo had made the LCD screen brighter. With Maxon’s Cinebench tool, the X1 Yoga scored 313 points for the processor test and 41.56 fps for the graphics test. It also scored 3,972 points using Futuremark’s 3DMark Sky Diver test. Even under heavy workloads, the ThinkPad X1 Yoga ran quiet. Fan noise was whisper quiet, and I found the system to be more quiet than the HP EliteBook when the machine is stressed. However, the X1 Yoga runs warmer than the EliteBook x360 during my test, and heat became a problem on the underside of the laptop in the area near the rear-facing vent. The X1 Yoga also comes with Rapid Charging, allowing you to use the 65W included charger to recharge your laptop to 80 percent in as little as 60 minutes. Additionally, Lenovo has also incorporated anti-fry technology on its USB Type-C ports. This prevents the laptop from becoming damaged due to poorly designed third-party USB-C chargers. Lenovo maintains its heritage in delighting business users with its ThinkPad brand, and this year’s ThinkPad X1 Yoga doesn’t disappoint. Whether you plan on adopting this convertible for primary use as a laptop or as a tablet, the X1 Yoga comes closest to a no-compromise convertible, offering the best tactile experience for keyboard, stylus or touch input. A thoughtful design means that stylus input isn’t an afterthought, unlike on competing machines like Microsoft’s Surface Pro, HP’s Spectre x360 and the Surface Book. The built-in recharging pen silo makes it easy to grab the active stylus for note-taking and drawing. For tablet users who prefer working with the touchscreen, Lenovo’s exclusive Wave keyboard adds stability to the keyboard design, making the X1 Yoga equally as comfortable for use as a tablet or as a laptop. As a laptop, the X1 Yoga’s keyboard is unmatched on any convertible and can even induce keyboard envy on even some of the best laptops, Ultrabooks or mobile workstations out there.